One way of describing this site would be “strange beliefs people have and how they got them.” A curious footnote that doesn’t seem to fit in nicely on any of the other pages is a phenomenon known as the Stockholm Syndrome. 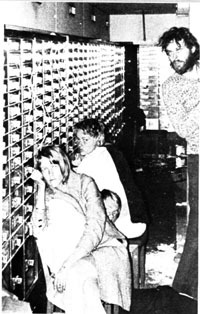 In the summer of 1973, four hostages were taken in a botched bank robbery at Kreditbanken in Stockholm, Sweden. At the end of their captivity, six days later, they actively resisted rescue. They refused to testify against their captors, raised money for their legal defense, and according to some reports one of the hostages eventually became engaged to one of her jailed captors. Notorious in the United States is the case of Patty Hearst, who after being kidnapped and tortured by the Symbionese Liberation Army, took up arms and joined their cause, taking on the nom de guerre of “Tania” and helping the SLA rob banks. The Stockholm Syndrome comes into play when a captive cannot escape and is isolated and threatened with death, but is shown token acts of kindness by the captor. It typically takes about three or four days for the psychological shift to take hold. A strategy of trying to keep your captor happy in order to stay alive becomes an obsessive identification with the likes and dislikes of the captor which has the result of warping your own psyche in such a way that you come to sympathize with your tormenter! The syndrome explains what happens in hostage-taking situations, but can also be used to understand the behavior of battered spouses, members of religious cults, Holocaust victims, household pets, and perhaps even users of Internet Explorer. I think it may also help explain the popularity of government and of the mass institutionalization of young people. The original supposed victim of “Stockholm Syndrome” is Kristin Ehnemark, who appears to have kept her head while managing, with Olafsson’s assistance, to keep Olsson and an army of trigger-happy police from an all-out fire fight. Here lies the source of the “syndrome.” Olafsson was initially arrested and convicted. Ehnemark was said to be mentally disturbed for trying to defend him. The idea that two calm, unarmed people were more effective than a highly trained and lethally outfitted police force was intolerable to 1970’s sensibilities. Many people still have the event hopelessly confused with the terrorist kidnappings of the 1972 Munich Olympics (source of the misnomer, “Helsinki Syndrome”). The botched bank robbery is simply too mundane to be the source of such an exotic explanation, which really seems to have been more of an attack on the idea of peaceful resolution tactics, particularly when applied to mentally disturbed perpetrators (as if murderers, rapists and armed robbers were not severely dysfunctional). FreeAdvice’s "Microsoft Monopoly" Survey — does the "Stockholm Syndrome" apply in cyberspace?